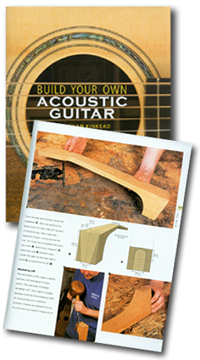 In 2002, Jonny’s reputation was such that he was approached by Quarto publishing with a project on writing a detailed ‘How To’ book on the acoustic guitar building process. As this had always been in the back of Jonny’s mind for most of his working life, he literally jumped at the opportunity to work on producing a definitive guide with a top flight publisher. The book is lavished with stunningly gorgeous photographs, a wonderfully clear layout and polished creative design. It has allowed Jonny to pass on to future generations the skill and craftsmanship developed over a lifetime’s devotion. Fortunately at the same time the above opportunity presented itself, Jonny’s wife Eva had just taken a career leap becoming a full time professional writer, so she was also able to take some quality time out to co-write the work within the tough deadline then required. Eva & Jonny worked on the text together for several intense months. The finished product would not have seen the light of day without their teamwork and the total support of Quarto’s professionals, particularly Piers Spence who remained a source of dedication and inspiration throughout. They are all very proud of the book’ How to Build Your Own Acoustic Guitar’ published in 2004. Jonny hopes the work will guide many budding luthiers on their journey through the rewarding yet challenging path of the total acoustic guitar making process.